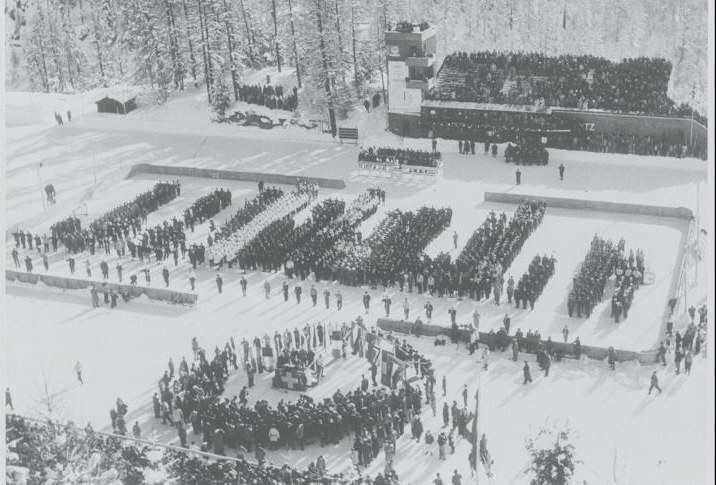 The opening ceremonies for the 1948 Winter Olymic Games started at 10:15 am on January 30th along with the initial hockey games and the first two runs of the two-man bobsled. The closing ceremonies were to be held at 4:00 pm on February 8th. 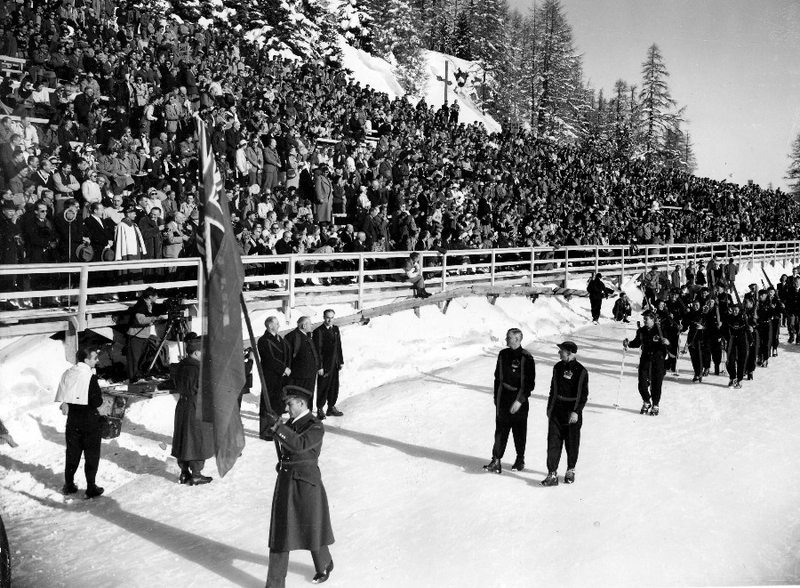 Medals for closing day events, including hockey, would be awarded at the closing ceremonies. The Olymic hockey schedule is illustrated below. The atmosphere for me was electric. It was a general cloudy day with the temperature just below freezing. The sun did come out for a few hours just around mid day. Thinking of the significance and tradition of the Olympic Games one could not be overcome with the nature of the spectacle. Pressmen from all over the world were rushing around in jeeps, while visitors piled into local transportation sleighs. Perhaps because of travel restrictions, perhaps because of budgets, Canada had 4 press personnel accredited, but we typically only saw Jack Sullivan representing Canadian Press who covered the hockey games. It seemed the entire town of 2,500 had turned out to see the procession – along with more than 10,000 visitors. This was a reasonably significant number as currency restrictions in Europe severely limited "tourist travel". Some visitors chose to watch them from their hotel balconies, highball in hand. The procession and atmosphere was ceremonious and pageant–like under ideal weather conditions. Twenty–eight nations participated. 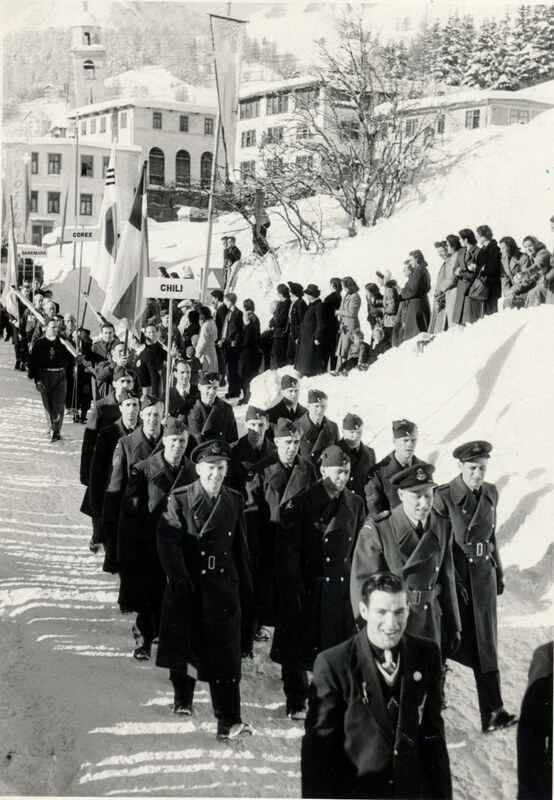 The athletes from the various nations assembled in front of the luxurious Kulm Hotel in the center of St. Moritz for the traditional march to the stadium over a distance equivalent to 4 city blocks. 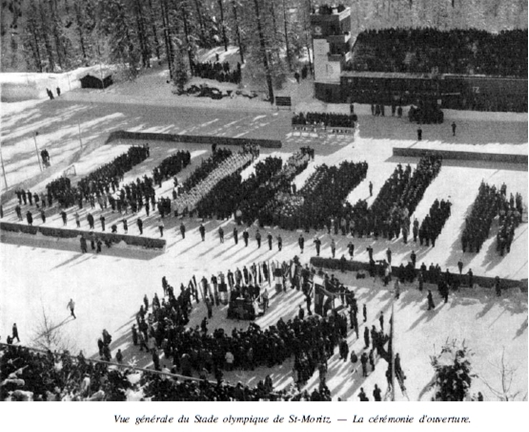 The athletes were to march three by three to the (Badrutts Park) Stad Olympique (ice) (Olympic Stadium). The two-mile long parade of athletes got underway at 10:15AM about 45 minutes later than scheduled. 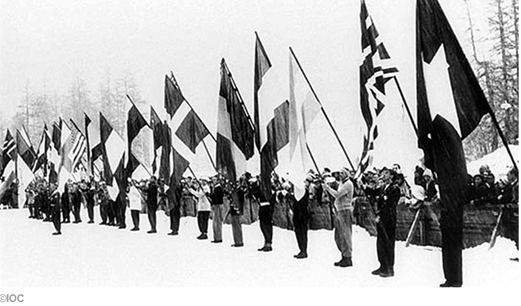 As is common in all Olympics, Greece, birthplace of the Olympics, led the procession and the international display of colors in the opening–day parade. 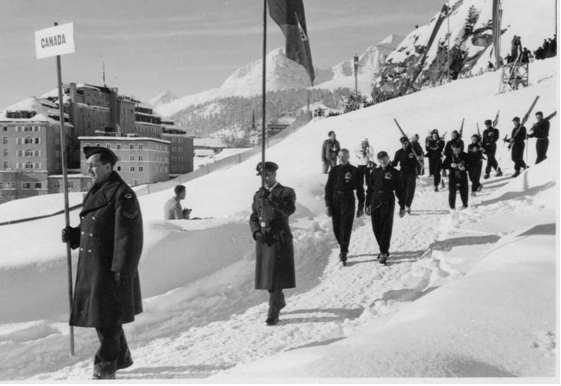 Other nations followed in alphabetical order; Greece (delegation of 6), Argentina, Austria, Belgium, Canada (41 officials and athletes), Chile, Korea, Denmark, Spain, United States (one of largest delegations with 92 men and women), Finland, France, England, Holland, Hungary, Iceland, Italy, Lybia, Liechtenstein, Norway, Poland, Romania, Sweden, Czechoslovakia, Turkey, Yugoslavia, and finally Switzerland. Some 915 athletes from 28 countries were in the parade. I was at the front of the Canadian delegation carrying the Canadian flag. (My mother back in Montreal – who had not heard from me in a number of weeks – was particularly surprised and pleased with the Montreal Daily Star article headlined: "Hubert Brooks Leads Canucks Games’ Parade"). 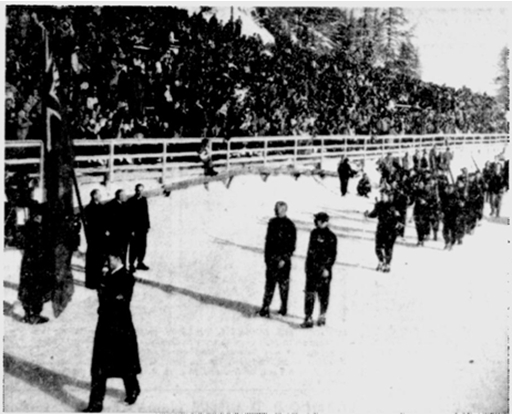 Trainer George McFaul was in the lead holding a CANADA banner. I, along with the rest of the Canadian Olympic hockey team were dressed in our regular R.C.A.F. uniforms. The Canadian contingent consisted of 41 officials and athletes. We were the sixth nation in the march past. I was immediately followed by A. Sidney Dawes, President of the Canadian Olympic Committee and Thorney Pickering Assistant GM Canadian Olympic Team. The female and male members of the Canadian ski team followed, skis over their shoulders. 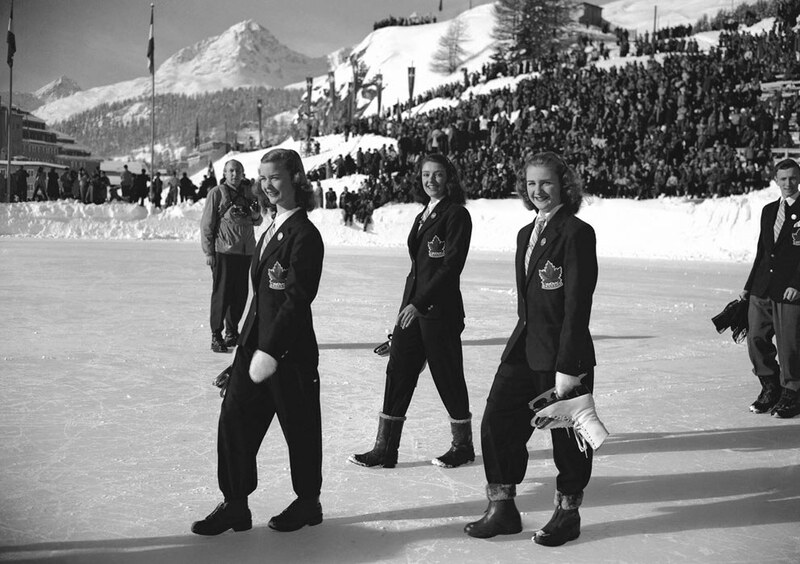 Next was Barbara Ann Scott decked out in her blue blazer and warm ski trousers and heavy boots walking alongside her mother, Mrs. Clyde Scott as well as with the Canadian figure skating judge. The other figure skaters were next, all with skates over their shoulders. Next were the speed skaters followed finally, at the end of our contingent, by the R.C.A.F. hockey players in their regular service uniforms, arms swinging and heads held high. Manager Sandy Watson was out in front of the team setting the tempo. George Dudley could not have been prouder! We paraded down the hill into the stadium. We drew applause as we circled the arena. 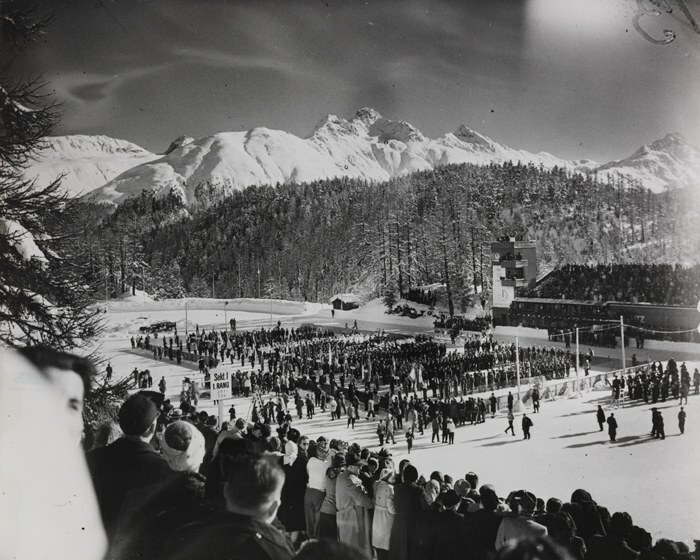 Britsh PATHÉ has an online video showing the 1948 Winter Olympic Opening Ceremony as well as several clips from the various Olympic Hockey Games. 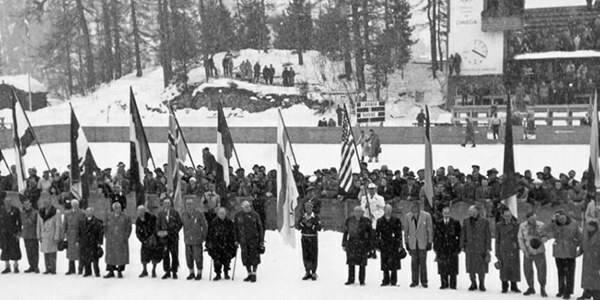 The opening seconds of the video shows Hubert Brooks carrying the Canadian flag followed by the Canadian olympic competitors. 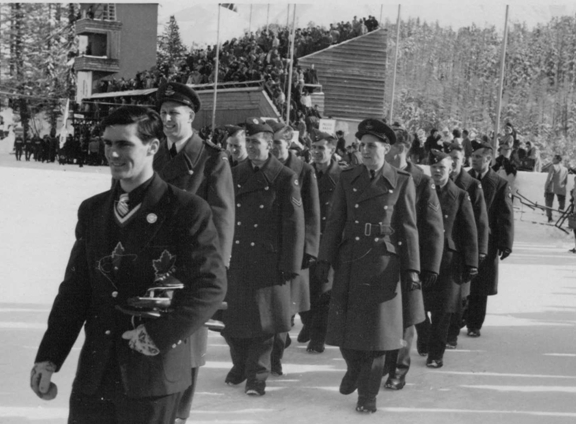 YOU TUBE has a few videoes archived concerning the 1948 Winter Olympics. 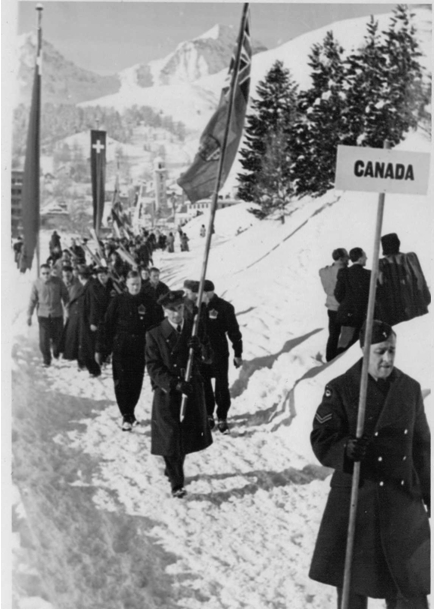 and in the second German produced film clip can briefly see Hubert Brooks carrying the flag for Canada along with the RCAF Flyers marching in. Thousands in the small stadium and those standing on the face of the surrounding hills cheered and applauded. Barbara Ann was the pin–up girl of the parade if one could judge by the applause as photographers scooted in front of her for close–up shots. Barbara led the Canadian woman figure skater contingent (see photo far right) with fellow Canadian skaters Marilyn Ruth Take (centre) and Suzanne Morrow (far right) immediately following. 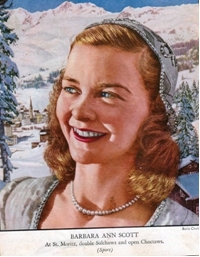 Previously she had made the cover of TIME magazine (right). Barbara nodded, waved and grinned. Ironically enough the American AHA team did not take part in the ceremonial march–past. Avery Brundage of the U.S. Olympic Committee won this battle and the rival U.S. 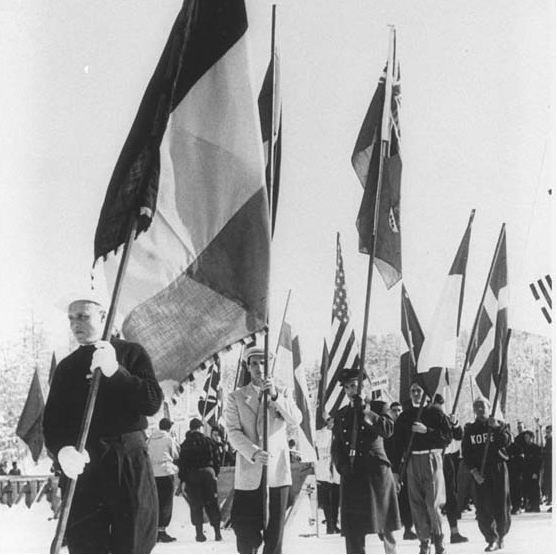 Amateur Athletic Union hockey players, decked out in plush white winter jackets, participated in the opening ceremonies – what was to be their only activity. 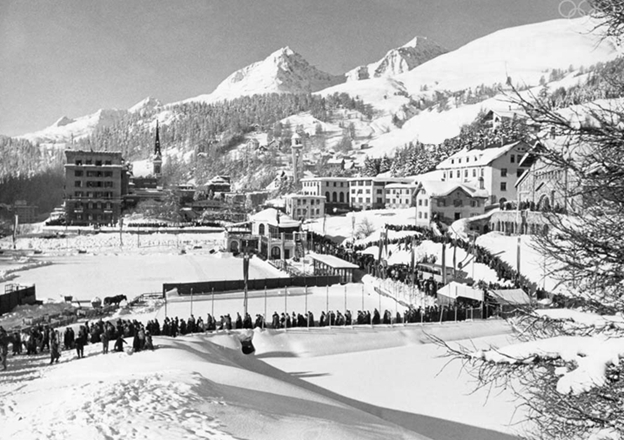 The American contingent of athletes (center, in while coats) into an outdoor stadium during the opening ceremonies of the 1948 Winter Olympics at St. Moritz, Switzerland, January 30, 1948. 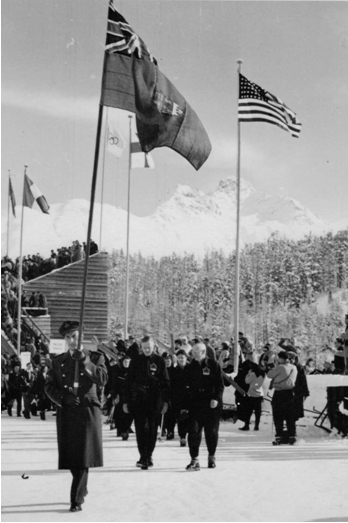 Jack Heaton (Skeleton, Bobsled) carried the flag for the Americans. 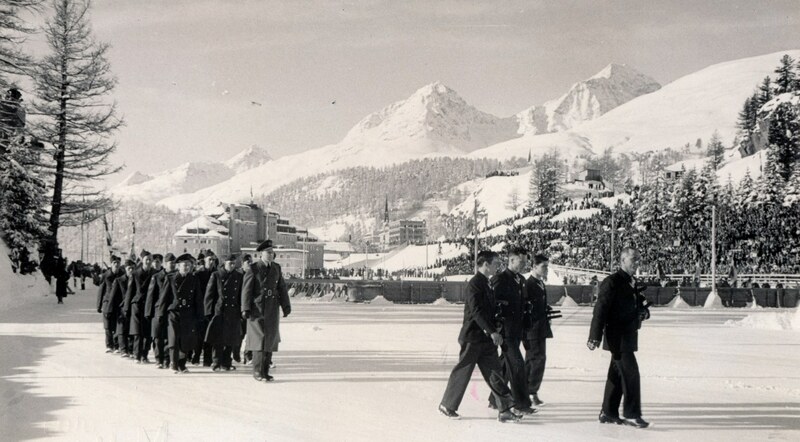 in St Moritz, Switzerland, opened by Swiss president Enrico Celio. 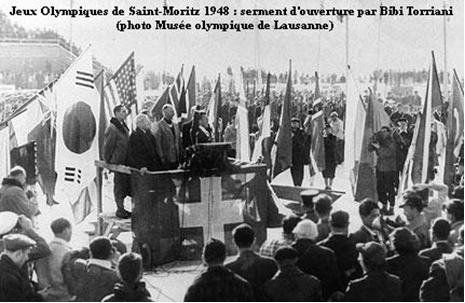 Once all of the nations had arrived and lined up in the stadium, the flag carriers then formed a procession marching to the center Olympic podium which we encircled. 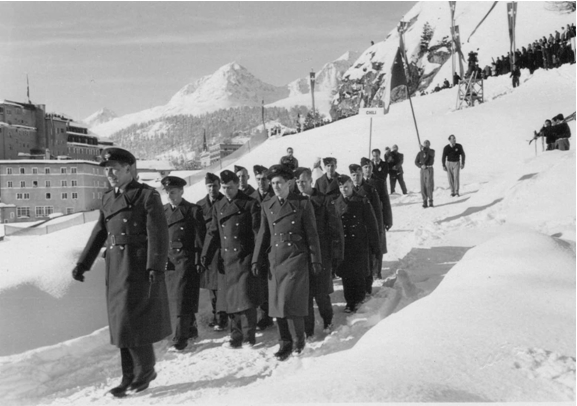 XAADG042 Saint-Moritz 1948 –The flag carriers. 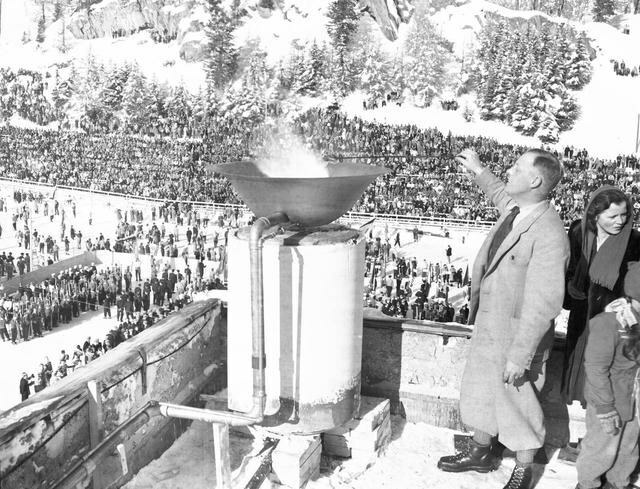 "I declare the Fifth Winter Games, as part of the modern Olympic Games, to have begun," said Enrico Celio, President of the Swiss Olympic Federation. Celio then departed from the protocol to add: "This brilliant manifestation will be a symbol of world peace to come." His words may have sounded hollow in the ears of those who have sought compromise settlement for the U.S. hockey dispute. 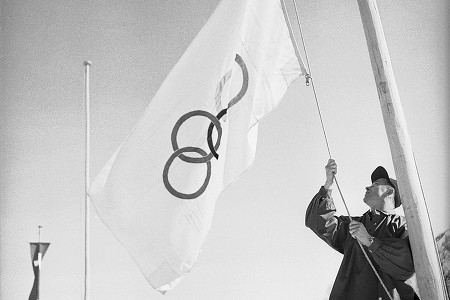 However bright sunshine contributed to the carefree spirit of the crowd, but clearly in the ranks of officials involved in, the hockey dispute there was no gayety – only a grim determination to prevail in the sizzling controversy as to whether the Olympic Games would have one, two, or neither of the U. S. teams participating. 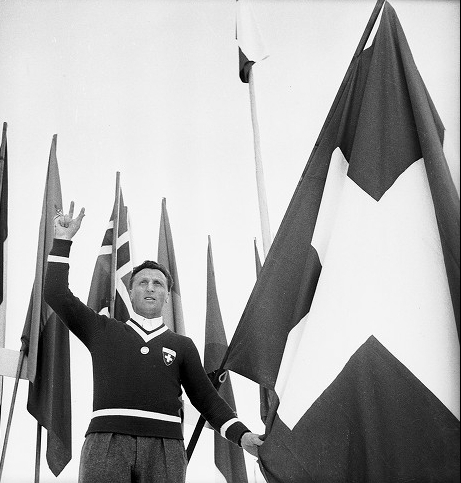 Bibi Torriani, the so called Grand Old Man of the Swiss team, who had performed for his national team 20 years earlier, swore the Olympic oath on behalf of all competitors. 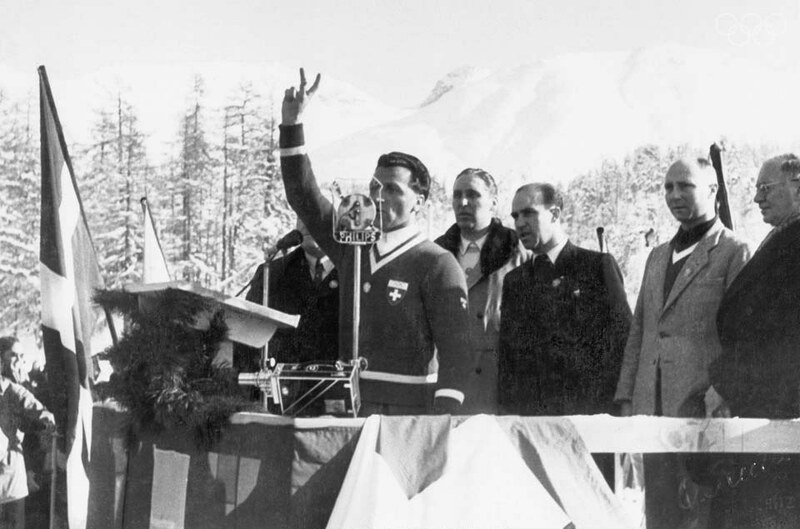 St. Moritz, 30 January 1948.
the Swiss hockey player Richard ‘Bibi’TORRIANI taking the Olympic oath, surrounded by the flag bearers of the nations. 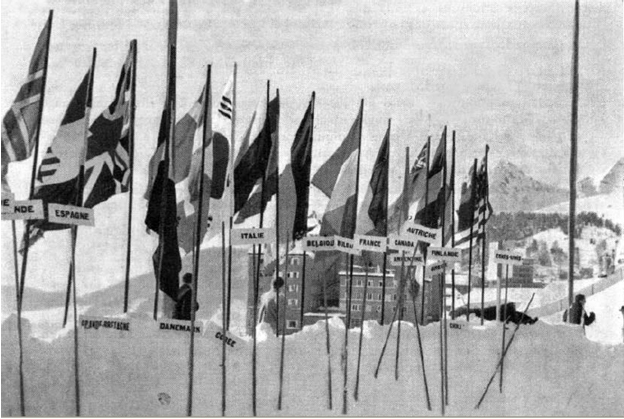 After the ceremony, we were directed to position each of the country flags in a bank of snow at one end of the stadium – a far cry from the formality of today’s Olympic Games. Following the parade, the team was brought back to our hotel in "cutters" - horse drawn sleds. For some "iron curtain" countries, like Rumania and Yugoslavia, it became clear that there was a deeper and grimmer game afoot. For some, competition had become almost a matter of life & death; some athletes were nervous about going back home if they didn't perform up to snuff. Soviet Russia sent no competitors, only a dour vigilante squad of ten observers. 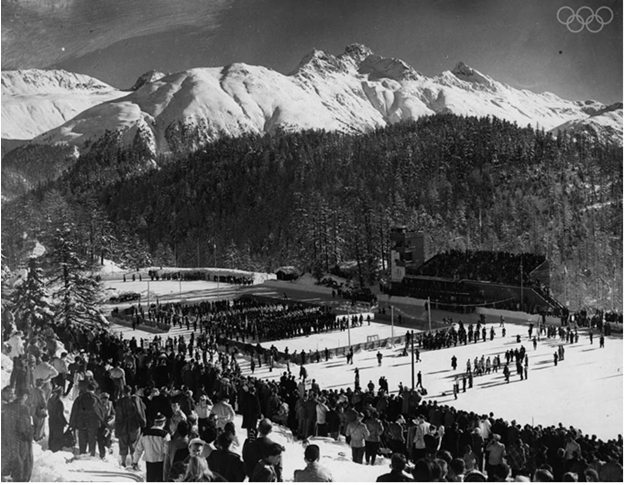 Most of the ice hockey games were held at the Suvretta and Kulm (Palace) stadiums in St. Moritz. The Stade Olympique (Olympic Stadium) hosted the opening and closing ceremonies. 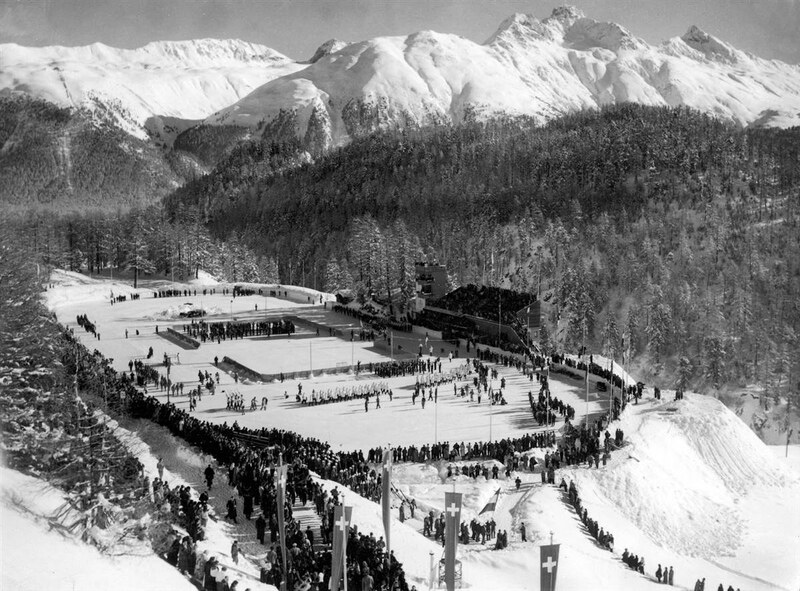 The stadium was also used for speed skating, the figure skating competition and the medal games for ice hockey.